This is part 2 of our jigsaw review covering amongst others Bosch jigsaws and key parts you should look at before you decide what jigsaw to buy. 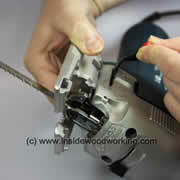 Part one on how to find the best jigsaw can be found here: Jigsaw Reviews. 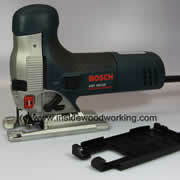 One of the most sold jigsaws ever, the Bosch GST80PE models come with a extended screwdriver. A specially countersunk screw holds the jigsaw blade in the shank. Most commonly used for Black and Decker Type U-Shank jigsaw blades. An hex screw holds the blade from one side in the shank. 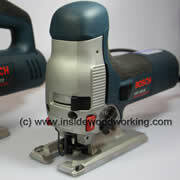 Various manufacturers such as Makita, Bosch, DeWalt or Festool offer quick saw blade change mechanisms. 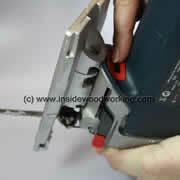 Without any need for a key or screwdriver, the jigsaw blade is changed in seconds. These systems make blade changes very easy. Any good professional jig saw (like in the picture next the Bosch 1590 evsk 6.4 amp ) comes with either an orbital or a pendulum action. The orbital action upward blade has a forward stroke, allowing operation at a higher cutting speed as well as fast, rough cuts. However, the orbital action increases the chance of splintering. The jig saw cuts other materials besides wood. The power tool will cut Metal or Aluminum for example, but you have to stop or shut down the average four position orbital action completely. Most professional jigsaws come with a for position orbital switch (0-3 position.) 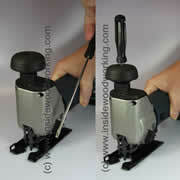 with position three offering the most aggressive movement for an effortless cutting in wood. 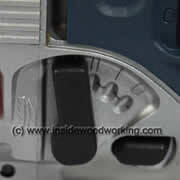 The base material of a jig saw is very important. Traditionally, jigsaw foots where made out of steel. Eventually manufacturers use cast foots so that the jigsaw base would be able to accept more devices. 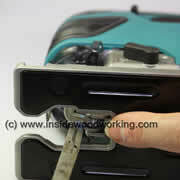 Some power tool companies (like Makita on its cordless jigsaw ) have developed a combined cast foot with metal insert. This provides the best of the rigidness of steel, and the adaptability of the cast. Jigsaw foot in steel Cast iron jigsaw foot on a Bosch jigsaw Some Makita jigsaws use a combined cast foot with a steel plate insert, to enforce the base. Usually composed of a durable nylon composite material, this attachment for the base of your jig saw is designed to protect scratchable or delicate services. 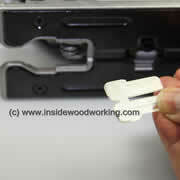 Today this attachment commonly eliminates sticky tape or other home remedies. 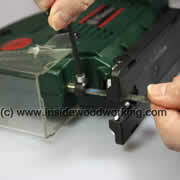 Making bevel cuts is an important function of any jig saw. 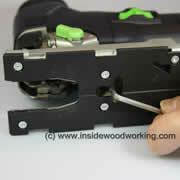 Normally a pivotal screw is aided by an Allen key, which adjusts the base or footplate on the jigsaw. 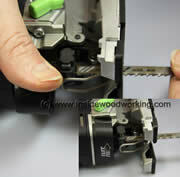 If you're planning to use your jig saw for bevel cuts, have a look at a 'keyless' foot adjustment system. Jigsaw with foot bevel adjustment using an allen key Bosch is using a simple lever to adjust the bevel of the jigsaws foot. Additionally a little wheel allows to adjust the tightness of which the foot is fastened. 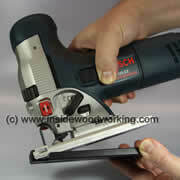 Any good jig saw Foot should be able to accept anti-splintering attachments. Occasionally of importance when cutting delicate surfaces is an anti-splintering inset. 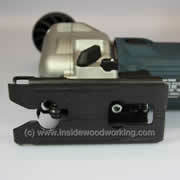 A good jigsaw (as shown here from a Makita jigsaw), allows a little plastic insert snatched into the foot. 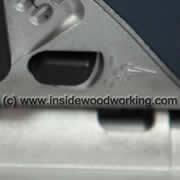 The insert provides no gap to the saw blade which prevents splintering. 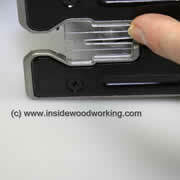 Regardless of what jigsaw blade out of your blade set you use, the inset gets cut and wears out after a while. Occupational health is becoming increasingly important. Dust extraction is becoming increasingly important. Some jig saw manufacturers have come up with innovative ways of incorporating the dust extraction hose into the Foot to improve dust extraction directly at the cutting point. 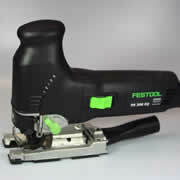 Festool jigsaw with dust extraction hose directly integrated into the cast jigsaw foot. Some manufacturers like Festool come with extra cutouts in the jigsaw foot, to allow additional dust extraction channels directly off the workpiece surface. Most professional Bosch jigsaws come with a mini dust blower right above the foot. It blows the cutting line free of chips and dust. Can be switched off if metal is cut (using cooling liquid). 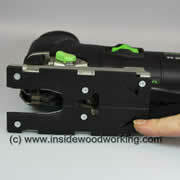 In our next part after this Festool and Bosch jigsaw review here, we will cover additional parts and accessories. This should answer most questions on how to find the best jigsaw for your profession. Part 3 of this jigsaw review here.